The acceptance of all major credit cards is a key factor in the satisfaction of your customers. Elite Merchant Systems will provide your retail storefront with processing solutions to accommodate them. 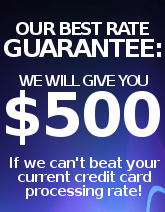 We offer the widest selection of Credit Card processing products and solutions. EMS will provide the services necessary to meet your needs no matter your size or industry. There are many benefits to allowing Elite Merchant Systems to set up your merchant account, below are just a few.